Fans of alternative rock, get ready for the most exciting event of the year!! 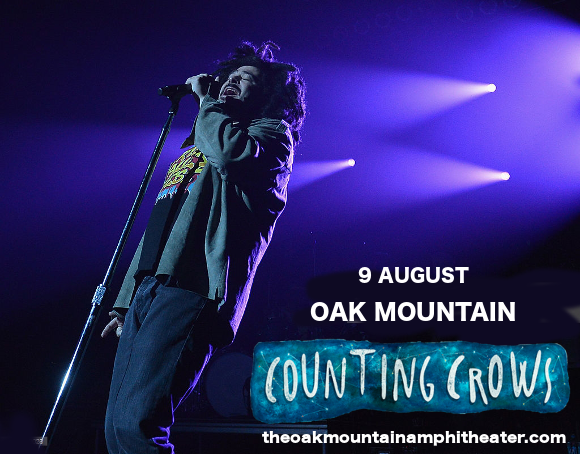 It’s none other than Counting Crows, on tour with the amazing Matchbox Twenty by popular demand for their second year running! The top pairing will come to the Oak Mountain Amphitheatre on Wednesday 9th August 2017 – don’t delay in buying tickets, as these will sell out FAST!! Counting Crows, hailing from California and forming in 1991, and Matchbox Twenty, formed in Orlando, Florida, in 1995, have a lot in common, not least sharing the same decade’s essential sound. With their debut album, “August and Everything After,” Counting Crows have sold more than 20 million albums worldwide, whilst Matchbox Twenty’s debut, “Yourself Or Someone Like You,” has had sales of several million copies, earning Diamond certification by the RIAA! The tour is named; “A Brief History Of Everything Tour 2017” and will run from July 12 through October 1, marking the second year that the two bands are on the road together. “To be honest, we took a vote after last year and decided to spend every summer with Rob (lead singer of Matchbox Twenty) from now on,” declared Counting Crows’ frontman Adam Duritz. “Can. Not. Wait.” Fans of the two bands together are going to be pretty pleased to hear that!! With Counting Crows’ Van Morrison-meets-Bob-Dylan alt-rock sound combined with the radio-friendly grunge style of Matchbox Twenty, this show has something for everyone. What are you waiting for?? Get your tickets TODAY! !